Proven stronger, healthier hair and reduced hair loss. An organic baby shampoo that is 100% free from irritating nasty ingredients. An earth-friendly shampoo carefully created for little princess. It cleanses little princess’s sweaty hair gently and keeps her relaxed and happy with the amazing scent of Lavender. Carefully created with nutrients rich and kid friendly ingredients, this earth friendly conditioner protects and nourishes kid’s hair without anything nasty. An earth-friendly shampoo specially formulated for little prince. It cleanses little prince’s sweaty hair gently and keeps him calm and happy with the fantastic scent of Orange! Authentically handmade, distinctively Asian by virtues of using oriental herbs and natural mountain spring water from YangMingShan National Park, Yuan Soaps do more than cleanse away dirt but also soothe the soul and mind. It is pure and natural, nothing artificial; nurtures and protects your skin with oriental herbs and moisturizing vegetable oils. 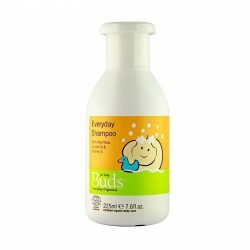 This Lavender scented amino acid and coconut oil based shampoo cleanses gently without irritating baby’s delicate scalp. Jojoba and Sunflower oils moisturize and keep baby’s hair soft while Aloe Vera extract soothes and hydrates his scalp. Vitamin E will maintain strong. Formulated with burdock root extract and organic rosemary oil, this revitalizing hair oil makes your hair look and feel softer, smoother and more manageable from root to tip.